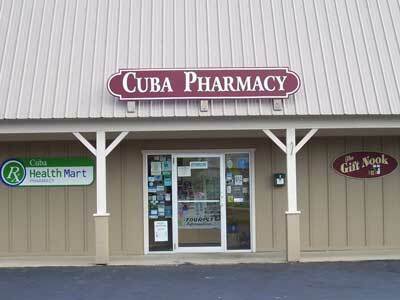 Cuba Pharmacy is a Health Mart Pharmacy owned and operated by Fillmore & Fisher Pharmacy Inc. Since opening in 1989, we have provided the Cuba area with fast, courteous and friendly service. We are located at 2 Center St., just off I-86. We are a full service pharmacy that accepts most major insurance plans. A consultation area is available to answer any concerns you may have about your prescription and any brand name / Health Mart OTC medications. We also have a blood pressure machine available during business hours. A full line of brand name / Health Mart OTC medicines, Nature's Bounty Vitamins and many durable medical items are available. Stop in each month to see our seasonal items that are available from our monthly coupon book. Available for your convenience is our Kodak Kiosk machine. Make prints from your digital camera, phone and from old pictures. Visit our beautiful gift shop The Gift Nook. There are many gifts to choose from to meet your giving needs. Looking for a Drug Retail Price List? Go to http://rx.nyhealth.gov/pdpw and type in Cuba's zipcode to get Cuba Pharmacies price list.